Rung to celebrate the wedding of Rupert Littlewood and Jenny Lane on 26 July 2014. Also to mark the 65th wedding anniversary of Philip and Joan Gray, founder members of the Society, who were married in August 1949. First peal in the method: 56-56.18.56-56.18-34-58-34-58 lh12d. Last updated Sunday, 15 February 2015 at 15:34:38. First submitted Monday, 8 September 2014 at 09:05:54 by Michael J Trimm. 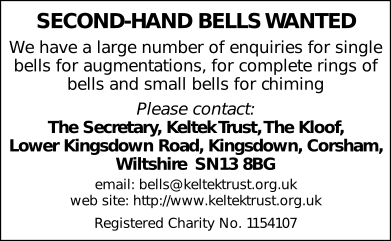 Sent for publication in The Ringing World on Wednesday, 1 October 2014 at 12:47:30, and printed in issue 5399, page 1066. This performance has been viewed 1000 times.